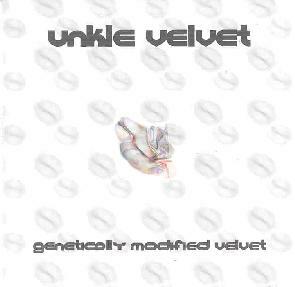 Unkle Velvet - "Genetically Modified Velvet"
Manchester, England’s Unkle Velvet explores a conceptual niche called Generative Music, a term coined originally by Brian Eno in 1996. Inspired by Sseyo’s “Koan Pro” software, it describes a methodology for creating music in which the composer is more the “instigator of the process”, rather than the “full specifier of the work”. Basically, what that means, is that the musician sets up certain parameters or rules by which the Koan Pro follows through many iterations. The music evolves on its own, exploring its own directions. It’s basically an offshoot of what Eno was doing with analog equipment on his early ambient albums of the 1970’s, when he recorded a few notes on separate reels, then ran the reels at different speeds to allow the notes to combine in different ways with each rotation. This may sound all rather dry and academic, but the results on Genetically Modified Velvet are far from that. Allowing the Koan Pro to compose in real-time, Velvet plays his guitar along with it, improvising to the evolving electronics, crafting pieces that can go just about anywhere. The album opens with Instigation No. 3, as sighing guitar floats through mellow space tones, bringing to mind Ash Ra from the New Age of Earth period, or one of the spacier Pink Floyd tracks. Things don’t stay mellow though. Mitosis kicks in with a pulsing rhythm, before exploding into a fiery jam of throbbing sequences, gurgling space noises and rocking guitar (although it has a rather unfortunate, abrupt ending that made me think there was something wrong with my player!). The disc notes say it’s hard to escape the Ash Ra (Tempel) influence on Crystal Shards, though I hear more of the Ash Ra, and not so much of the (Tempel). Again, Velvet seems to take his cue from New Age of Earth as lazy electronic sequences and flowing synth waves make this 8-minute journey quite blissful. Mystic is one of the standout tracks that slides from spacey synths and glissando to a heavier, down tempo rocker with more blazing guitar work. Feel the Magic is a trippy, ethereal pop tune, the only one with vocals on the album. Apparently, the Koan Pro even generated the order of the lyrics. Eugenix (re-gen) is different from a "re-mix" in the sense that Velvet uses the same set of rules as he did on the original piece (which appears on an earlier compilation), and regenerates a variation on the original piece. One of my favorite tracks, Blue Gene, is as lovely a slice of space blues as you’re likely to get, with gritty blues guitar against a gentle, deep space backdrop. Whirligig is an upbeat, semi-rocker, with an almost electronica style rhythm, reminiscent of Steve Hillage or even Ozric Tentacles. The album closes with a reprise to the piece it opened with, Instigation No. 3, this time with beautiful e-bow instead of guitar. Genetically Modified Velvet is in MP3.com’s Digital Automatic Music (DAM) format, so although the songs are all compressed into mp3’s, the CD can be played on both your computer, and your normal CD player. There’s all sorts of interesting info about the music on the disc as well, accessible on the computer via the DAM interface. You can visit the Unkle Velvet web site at: http://freespace.virgin.net/a.greenwood/unklevelvet.htm. Unkle Velvet’s MP3.com web page is at: http://www.mp3.com/unklevelvet.